One day, perhaps around the time of the outbreak of WW1, a handsome young man walked into Wakefield's shop at 137 High Street and had a photographic portrait taken. Around 100 years later Elaine Owen sent me a copy of this photo (she is not a descendant of the man featured). The sepia carte de visite is inscribed on the back Please return to Mr D Weathers, Park View Cottage, Isleworth. Elaine is not certain that the photo is of D Weathers - it might be a photo of his son or another relative - but it could be him and the fairly unusual surname, coupled with his forename initial and an exact address, provide a good starting point to find out more. The notes for no. 137 show the photographer Frank Wakefield was in business at 137 High Street from 1905 to 1920. The subject of the photo could be aged 25 to 35 - it is difficult to be exact - so it seems likely he was born between 1870 and 1895. This meant there is a good chance he was still alive in 1939 and was also included in the 1911 census. A search of the 1939 Register for any Weathers in Isleworth with a forename initial 'D' found a Daniel Weathers living at 83 Worple Road, Isleworth, birth date: 10 July 1881 - this falls within the timeframe expected. The entry gives other information: he was married to Cecilia (born 1890) and they had two children at home, Peter R (1915) and Norah M (1917). Daniel was an Overseer, Inland Section GPO London EC1; Peter was a Production Planning Clerk for a Scientific Instrument Maker and Norah a clerk for a food provisions merchant. Two other names, possibly other children, are currently redacted. 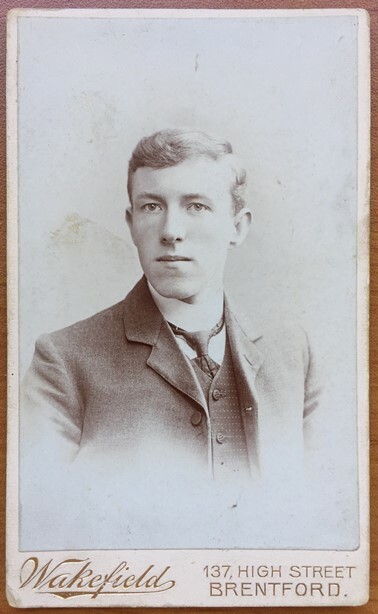 This could be our man - he dressed very smartly for the photograph, in keeping with having a post in the Civil Service, and his birthdate fits with the age of the man featured. So it seems the family moved from Ireland to England between 1875 and 1881. Philip Weathers probably worked in one of Isleworth's market gardens. The 1911 census (findmypast) shows the same family group, Daniel now 29 and a 'Sorter, G.P.O. London'. The birthplaces are more detailed here and show his parents were both born in county Cork, at Newmarket (father) and Freemount (mother). The family were living at 1 Silver Hall Place in 1911, as in 1901 (and not the address on the photo back). Electoral registers and military service records (both on Ancestry) provide important pieces of evidence: in 1916 Daniel Weathers of Park View Cottage, Worple Road, Isleworth signed up with the Royal Engineers. This matches the address on the photo - he is our man. The service records confirm his wife was Cecilia Weathers and add new information - they had married in April 1914. I could not spot a description of his complexion or hair colour, which would have helped determine whether the photo was of him, but he was 5' 6" tall and 140 lb (10 stone) when he joined up, with a 36" chest (expansion 3"). The electoral register for 1931 shows Daniel Weathers was still living at Park View Cottage with Cecilia and it seems probable their home was an older property, pre-dating other housing on Worple Road, and it became no. 83 when the road was numbered. It would be nice to pin down the photo date more accurately: the mount and his style of dress may reveal more to an expert. I guess he may have had the photo taken around the time he signed up in 1916, to leave with his wife? Incidentally his army service records show he was a Pioneer with the Royal Engineers and this opens up scope for further research.